Installing a metal shingle roof on a residential home will cost, on average, between $8.00 and $10.00 per sq. ft. There are a number of factors that determine that cost, and we’ll explore them in this guide. It’s perhaps most important to realize that of the three primary options for metal roofing (the others being Standing Seam at the high-end, and Corrugated and Ribbed Metal Panels at the low-end), Metal Shingle is in the middle of pack in terms of costs. At first mention, metal shingles sound bland, or perhaps too risky of an option in an area where they would clearly be outside the norm (i.e. all your neighbors have asphalt shingle roofs). Why would that be? Because the reality of metal shingles today, is that these are really metal tiles that are intended to mimic just about all other possible roofing styles designed for sloped roofs. Slate tiles, ceramic tiles, asphalt shingles, cedar shakes and say redwood shingle are all materials that metal shingles can mimic. From the curbside view, it would be hard to tell the difference between the metal material and its usual counterparts. That’s how diverse the metal roofing industry has gotten. Add to this the idea that metal itself can have a pleasing appearance, as is the case with copper, zinc and painted aluminum and steel tiles. Gone are the days when metal shingles only have a silver/gray, metallic appearance. Key Fact: There are really two basic types of metal shingles, or tiles: metal coated with metallic finish, often second coated with factory finished paint, and the second type which is often referred to as stone-coated metal tiles. 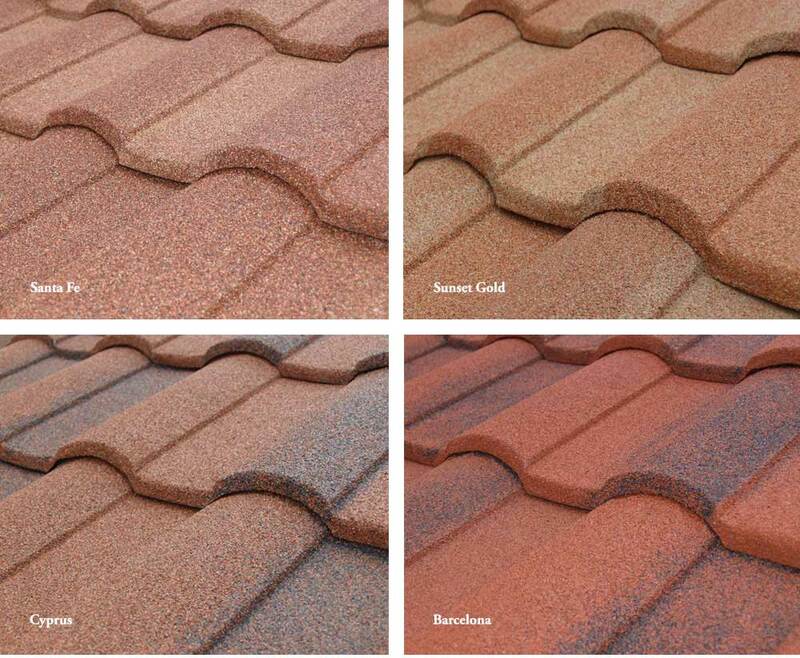 It’s the stone-coated variation that opens the door to having metal shingles that look nearly identical to asphalt shingles, because like asphalt shingles, they are coated with granules. 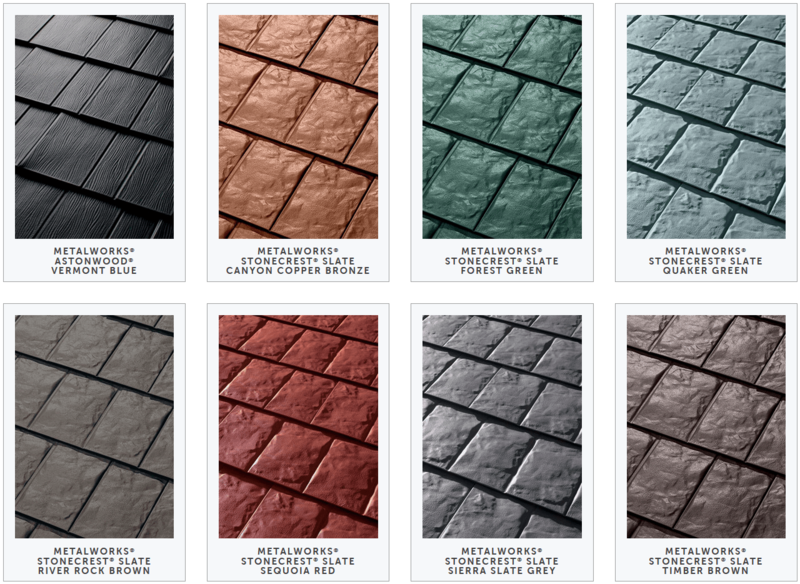 So, it’s not just color, but texture that allows metal shingles to obtain a great diversity in product options. 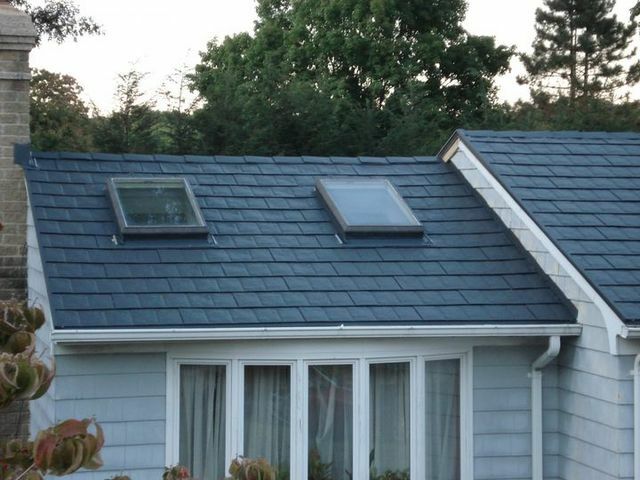 With texture as an additional option, slate, wood and ceramic are all possible appearances for metal roofing. Then there is shape, which varies a bit by manufacturer, but for the most part are rectangular, or diamond shaped. How it’s installed: Metal shingle installation relies on an interlocking system that makes for quicker installation and ability to hide fasteners. Some manufacturers still go the route of having panels of say 4 tiles (per panel) that are adhered to the roof deck. Panels are usually 4 feet long and are often installed over existing roofing (i.e. metal shingles can be installed on top of asphalt shingles). Did you know? Interlocking tiles are now the 2nd most popular type of metal roofing for residential homes after standing seam. The other consideration for shingle options is the material, or type of metal itself, but we’ll cover that in the next section.